I can confirm that the Flex 3” backing plate will fit. I do believe it will be tippy. Odd they are for the same mc, but different part nos. As per the web site. And the rubbber on mine is red and yours looks black. Hope they recently changed them, as I saw 2 posts about them breaking up. For anyone else you need to buy a M8 Low profile head Cap Bolt x 20mm as the Makita one is too short by 6mm. Note: Normal cap screws end up level with the Velcro. Hopefully the Rupes white Ultra Soft 100mm (with 75mm vecro backing) will just cover the rubber skirt. Hoping the 100mm might not make it too tippy. Makita UK are having trouble getting my 5” BP . So the 100mm pad will be welcome on narrow edges etc. But I really hope they can get me a 5” BP as this one is a bit unwieldy on the smaller more curvy panels. I tested the Flex 3” BP today just free air and no Pad. 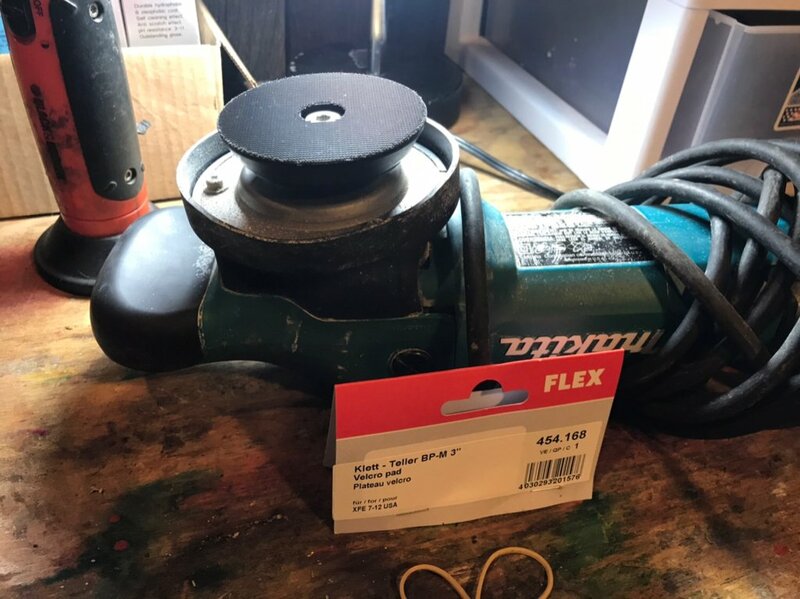 I was surprised that it was not as smooth [vibration free] as when the Makita 6” BP was in it. On level 3 it got better, but on level 1 the Polisher definitely vibrated more. Hopefully it will get better when I put on the Rupes 100mm Ultrasoft pad. So I guess when you see the marketing bs saying they matched the pad weight with the machine .. I guess they are telling the truth. I would have thought the smaller 3” BP would have caused less vibration, but not so. Intrigued to see if their is a difference running the Makita 5” and 6” std. BPs. thats of I can find someone to sell me one and ship it to the UK. In honesty, I would totally agree with you. I only tried it as the 3” backing pad cost £20. V £300 for the Flex 7-12 80. And I realised it would need a 100mm Rupes pad on it, that just comes to the black skirt. Plus I am finding it almost impossible to get the Makita 5” BP. US wont ship to UK, cant fond a German Dealer to ship to the UK. And Makita UK dont sell it! I did this a few weeks ago but our forum gallery was down so I didn't get the pictures uploaded. Appreciate the link and the effort. Very interesting you found it smooth running. I noticed just running free air without the intended 4” pad it, on speed 1 it vibrated more than the 6” backing plate on its own. But seemed better on speed 3. So hopefully the extra pad weight will make it smoother, plus of course putting it on the panel. I used the Flex pad as the M8 bolt just went through perfectly. Lovely job on that Mercedes btw .... she really popped! To each their own if it works for you that's great. I coined the term tipsy to describe using large tools with small pads (and thus small backing plates), --> WHEN buffing on horizontal panels as the larger size and weight of the tool, being used/balanced over a pad size the tool was never intended to be used with or envisioned to be used with makes the operation of the tool tipsy. And this is because the user must focus on the task at hand and properly grip the tool as they work it over the panel. It's easy to NOT focus on what you're doing because most people are used to using full size tools with the normal sized pads and backing plates and with some applications it's all to easy to just let the weight of the tool do the work, thus not focus on gripping the tool with purpose. I just point this out because I've detailed a zillion cars and unlike a lot of guys that also have detailed a zillion cars what separates me from them is I tend to WRITE more about it, make more videos about it and teach a heck of a lot more people about it thus I tend to "know" more about the process as it relates to the explaining, sharing and teaching of the craft. And as a favor for those that have not detailed a zillion cars once in a while I come up with a term to describe something and then share it. Also note - polishing VERTICLE panels with smaller pads (and thus smaller backing plates), than any tool was designed for, envisioned or intended to be used with is NOT so much of an issue because now you will NATURALLY be holding and thus supporting the weight of the tool as well as PUSHING it against the vertical panel so the TIPSY aspect does not exist. My use of the word tipsy only applies when buffing out horizontal panels for the reasons I shared in the first paragraph of this post. Makita PO 5000C and PO 6000C backing pads availability? Any US Forum members want a 6” backing plate for the PO5000C?